Gibson EH-150 Model Tube Amplifier (1938), made in Kalamazoo, Michigan, serial # 7939, tweed fabric covering finish. This is a truly superb example of the world's first great guitar amplifier, Gibson's EH-150. This is the ca. 1938 variant, built into a larger slightly arched cabinet with rounded off upper corners. 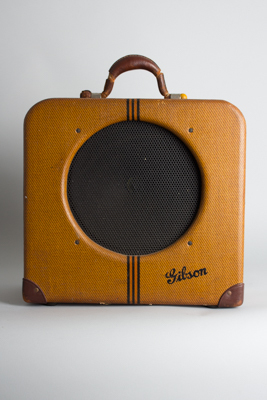 The gold/brown tweed cabinet cover has orange and black vertical stripes in the center, with a black script Gibson logo in the lower right hand corner. The square lower cabinet edges have leather corners and round hard rubber feet. The front speaker aperture is covered by a black metal grill. The removable latched back reveals the deco-styled control panel which lays out left-right with an on/off switch, fuse, microphone volume, instruments volume, 1 mic and 2 instrument inputs, and a tone control switch (bass and normal). The original field coil 12" speaker is still in fine condition. This was the premier professional amplifier of its day, as used by Charlie Christian and a host of other 1940s greats, and is still a wonderful and unique-sounding amp today. Height is 15 5/8 in. (39.7 cm. ), 16 1/4 in. (41.3 cm.) width, and 8 3/8 in. (21.3 cm.) deep. This is the nicest example of this classic amplifier we have seen in a long time. The cabinet is solid, the fabric covering has only small dings and stains, the paper-and-leather handle is mostly intact, and internally it's exceptionally clean. Except for a new power cord and few internal tweaks it's all original as well; a wonderful survivor of the earliest age of amplification. Excellent Condition.